Maine is the best of New England wrapped up into one state—swaths of rural farmland, small towns with general stores and covered bridges, scenic villages nestled into a rugged coastline. Whenever I talk to people about what they love about Maine, it always feels like I’ve been let in on a secret that few outsiders know about. Because if they did, Maine’s inland would be mobbed with visitors. Perhaps it’s the challenge of the journey that stops most of the crowds—parts of Maine are so remote that they take hours to reach, even after you’ve arrived in Bangor, which is 3 hours from the New Hampshire border. But if you’re one of the few craving a slower pace, fresh water, and outdoor adventure, this Maine travel guide is for you. Since the state is fairly large and the roads indirect, I’ve divided these up regionally: western Maine travel guide, central Maine travel guide (this one), and Downeast & Acadia travel guide (coming soon). 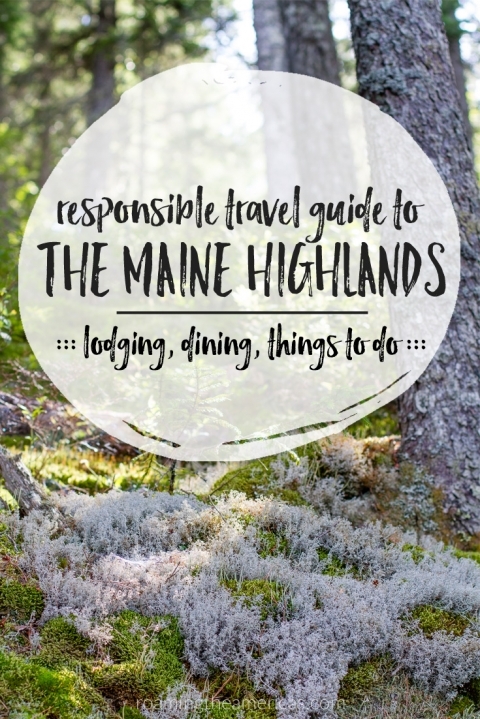 In this guide, I’m covering much of The Maine Highlands (view PDF map). Even this portion of the state is pretty big, so some of the places listed will be quite far from each other—you probably won’t be able to do them all in one trip. Bangor is a great jumping off point for this region, and you could easily spend a few days enjoying the growing food and entertainment scene in this small city before heading to more remote areas. One of the hardest things about planning a trip to a new area is knowing where to start. What towns should you begin your search in? Search Bangor if you’re looking for “city life” before heading into more remote regions. Heading northwest from Bangor, you’ll find a few options in the small town of Dover-Foxcroft, which is within 45 minutes of Sebec Lake and Moosehead Lake, as well as plenty of hiking. If you want to spend most of your time around Moosehead Lake, start your search in Greenville, a town on the southern tip of the lake. And check out the Millinocket area if you’re planning to head north to Baxter State Park or Katahdin Woods and Waters National Monument. 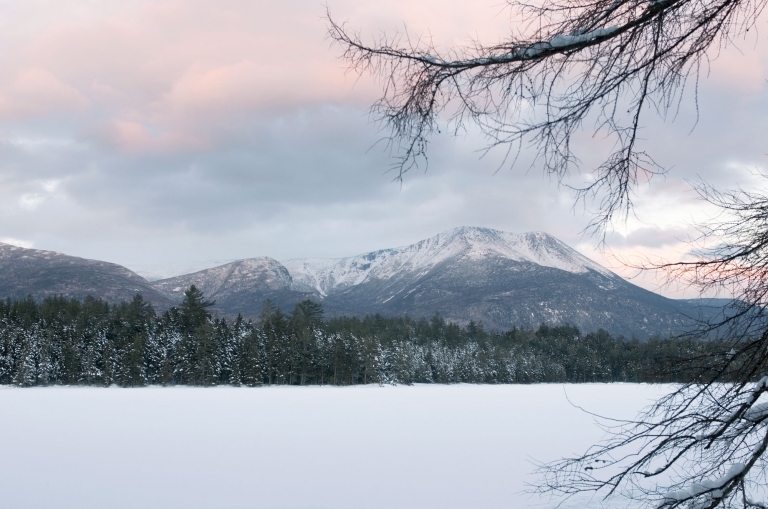 The New England Outdoor Center** has a few lodging options near Baxter State Park—from camping to cabin rentals to the more luxurious eco-friendly lodges. Want to enjoy a quintessential Maine summer experience? Rent a camp (translation: cabin, cottage, or summer home on a lake). Most Mainers I know (myself included) have passed many a summer day “uptah camp”—boating, water skiing, swimming, or just skipping rocks. Check out Spencer Pond Camps**, which are fairly remote, off-the-grid camps open from May-November. Some camps are also accessible during the winter and heated, so they’re another option for winter vacations. If you’re looking for a four seasons option, check out Tomhegan Wilderness Camps on Moosehead Lake. For those looking for more comfort, Maine has plenty of inns and bed and breakfasts. Listed on the National Register of Historic Places, the Lucerne Inn is one of the most beautiful places to stay in central Maine. If you want to travel farther west from Bangor toward Moosehead Lake but still crave comfortable lodging, I highly recommend The Mill Inn*** in Dover-Foxcroft. The Mill Inn is a boutique inn that is in a renovated historic mill located in the heart of Maine. A philosophy of sustainability is woven into every element at The Mill Inn—from the mission to revitalize Maine’s economy through renovating a historically significant building, to the locally-sourced products in the cafe, to using reclaimed decor and found objects from around Maine in each room. Looking for more places to stay in central Maine? Find the best deal, compare prices, and read reviews from other travelers at TripAdvisor. Find bed & breakfasts in central Maine at bedandbreakfast.com. 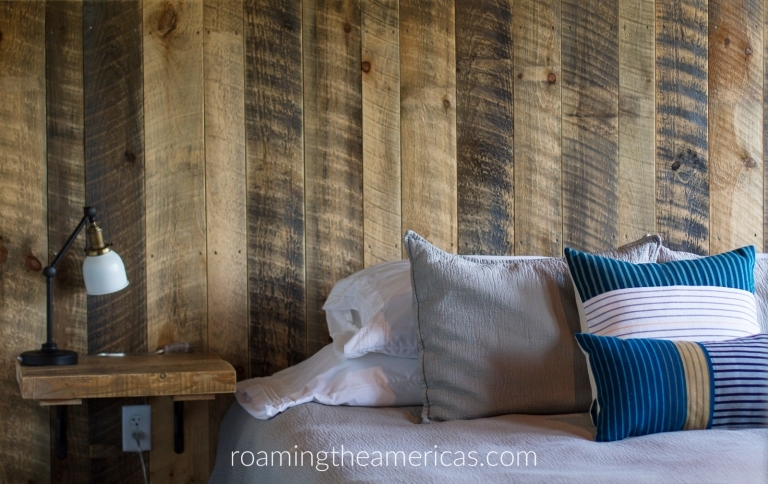 And always a good option for connecting with local life for varying budgets and levels of comfort is booking a room, house, or camp on Airbnb*. While finding farm-to-table dining options in rural areas is a bit more challenging than in urban or touristy areas, they do exist. It sometimes takes more digging to find them because it’s not a marketing strategy but simply a way of life. In addition to restaurants using locally-sourced or organic ingredients, I’m also including a few restaurants that are popular with locals. Treworgy Family Orchards* is one of my favorite ice cream shops in the Bangor area. It could be because I used to work there in high school, went to school with the Treworgy’s, and had Mrs. Treworgy as my Spanish teacher in high school. But judging by their continued growth and popularity, I’d say that most people love it for the great ice cream (Maine-made Gifford’s brand), creative corn mazes, apple picking in the fall, petting zoo, and overall great atmosphere. If you want to support a working family farm that loves welcoming friends, neighbors, and visitors, check out Treworgy’s. TIP: Grab an ice cream on a summer night around sunset—they’ve got an incredible view. Another popular ice cream shop in central Maine is Butterfields Ice Cream* in Dover-Foxcroft, which has been serving homemade ice cream since 1950. Though the ownership has changed a few times, they still use many of the original recipes and have remained popular throughout generations. Heading up to Moosehead Lake, you’ll see a lot of trees, not very many street lamps, and a few small towns. Abbot Village Bakery is a popular spot in one of those small towns along this route. Stop in if you’re craving a treat because you won’t have many other options until you reach Greenville. The steady stream of customers can’t be wrong about where to find some of the best breakfast and lunch in Bangor: Bagel Central*. And it’s no wonder—their homemade bagels are legit. They offer plenty of other homemade options on the menu, lots of seating inside, and a few tables and chairs outside on the sidewalk. Another favorite restaurant in downtown Bangor is Giacomo’s*. When I went last summer, I loved the cheeky humor in their signs and menus, and it was an overall great atmosphere with friendly staff. Giacomo’s is currently under renovations with new ownership, but it looks like it will maintain a local commitment—from locally-made furniture to featuring Maine and New England grocery products. Stone Sparrow Cafe is a small, cozy spot on the outskirts of Bangor that serves homemade breakfast and lunch made from many local products. Fork & Spoon is a “quirky, conscious eatery” in downtown Bangor that offers fresh, made-to-order sandwiches, salads, smoothies, and more. They have vegetarian and gluten-free options, as well as locally-roasted coffee. If you’re in Dover-Foxcroft on a Sunday, there is no better place to enjoy brunch than Stutzman’s Farm Stand and Bakery*. Stutzman’s is the kind of place you won’t just stumble across or find in a guidebook. Google them and you’ll find only a Facebook page and some farm listings. But the food is incredibly fresh and made from scratch, and the cafe is packed with locals who come to enjoy the Sunday brunch and live music. And if you’re in Greenville during the summer months, grab some crepes made with fresh ingredients at Claudine’s Cafe Crepe food truck. Want to know where the locals go? For breakfast, lunch, or “suppah,” check out Governor’s in Bangor or Dysart’s in Hermon. Governor’s Restaurant* has been around for more than 55 years and now has 6 locations throughout Maine. It’s a great place to go if you’re looking for homestyle food, reasonable prices, and friendly local faces. The Fiddlehead Restaurant in Bangor is uniquely Maine–in both name and cuisine. Anyone who grew up in Maine knows about fiddlehead season–a short time in spring when edible ferns (called fiddleheads before they unfurl) pop up everywhere. Mainers are known to pull over to the side of the road to pick them for dinner whenever they spot a great patch (ahem, speaking from experience). Aside from the locally-inspired name, The Fiddlehead Restaurant offers local food, such as produce grown on their own farm in season, local cheese, local and sustainable seafood, and produce from other farms throughout Maine and New England. In Greenville, enjoy fine dining accompanied by a spectacular view at Blair Hill Inn & Restaurant, which sits on top of a hill overlooking Moosehead Lake and the surrounding mountains. The menu at Blair Hill Restaurant is seasonal, and much of the food is grown in their own garden or come from local farms. Looking for more places to eat in central Maine? Find the best deal, compare prices, and read reviews from other travelers at TripAdvisor. This region is full of spectacular scenery, incredible hikes, and outdoor adventure. But there are also plenty of ways to explore history, enjoy live entertainment, and connect with local culture. Central Maine has some of the best hiking and outdoor adventure in the state. Remember the Leave No Trace principles whenever you’re enjoying creation so that we can preserve it for others to enjoy. Take the Moosehead Pinnacle Pursuit–a 6-mountain hiking challenge in the Moosehead Lake region. Or go at a more leisurely pace and just hike one or two of the summits. Mount Kineo* is a great half-day hike that offers panoramic views of wilderness and mountain ranges in the area. It sits on a peninsula on Moosehead Lake but has no road access, so it’s virtually an island. Head to the Kineo Public Dock in Rockwood to take a ferry ride across the lake (run by the golf course with a fee charged). Grab a trail map at the golf course clubhouse, and head out on the waterfront trail. The views from Indian Trail get better as you ascend, but be prepared to climb the fire tower at the top if you want to see anything from the summit (it’s challenging but completely worth it). If it’s hot and you’ve worked up a sweat, head down North Trail to go for a swim at Hardscrabble Point (there are several campsites here, but you can walk past them to a small peninsula with a pebble beach). If you’re looking for some of the best waterfalls in central Maine, head to Gulf Hagas*, an 8-mile waterfall trail that is part of the 100 Mile Wilderness section of the Appalachian Trail and a national natural landmark. History lovers will also enjoy the Katahdin Iron Works state historic site that you will pass by as you drive to the trail head. For easy hiking in the Bangor area, check out the trails at Bangor City Forest and Orono Bog Walk. The truly ambitious hikers will want to tackle Maine’s highest peak and the northernmost point of the Appalachian Trail, Mount Katahdin* in Baxter State Park. I hiked it when I was 9 years old (including Knife’s Edge), but don’t let that fool you. The trails are challenging, the hike will take all day, and you should be in good physical shape to hike Katahdin. TIP: don’t plan to just show up on the day you want to hike Katahdin. You’ll need to make reservations for parking, and do so far in advance in the summer, especially weekends. In 2016, Maine gained another nationally-recognized outdoor recreation area about an hour north of Bangor. Though not technically a national park (the only one in Maine is Acadia National Park), the Katahdin Woods and Waters National Monument is maintained by the National Park Service. A bit remote without any public facilities (currently), it’s a great area to explore Maine’s wilderness year round. Though there are no welcome centers in the monument itself, two visitors centers have been created in nearby communities. Heading to central Maine in the winter? With snow during about a third of the year, Mainers know how to have fun in the winter months. Enjoy a favorite Maine winter activity by renting a snowmobile* and heading out onto thousands of miles of groomed snowmobile trails in Maine. Find more information about snowmobiling in Maine and get a few snowmobiling tips here. Or head out on designated trails with a pair of snowshoes or cross-country skis. Looking for a little history and cultural insight to the area? Check out a piece of Maine’s history in the Underground Railroad by visiting the North to Freedom statue in Chamberlain Freedom Park just across the bridge from Bangor. Head north from Bangor to Old Town (yes, the canoe) to get a glimpse of the region’s Native American heritage at the Penobscot Nation Museum. Or stop off at the Hudson Museum on the University of Maine campus in Orono to see thousands of Native American artifacts and over 900 from around Maine. If you feel like you’re seeing nothing but trees while you’re in Maine, you’re right. Maine is 90% covered by forest, and all those trees played a prominent role in Maine’s economic history—from logging on the Kennebec River to Bangor as a major lumber port to the paper mills that once employed many Mainers. (My father included—anyone from central Maine knows the distinct smell of a paper mill well, and probably knows someone who worked at one.) Explore this heritage at the Maine Forest & Logging Museum near Bangor, which has nature trails, a reconstruction of a logging and milling pioneer community, and more. If you venture up to Greenville and Moosehead Lake, check out the Moosehead Historical Society* to learn about the role of logging, Native Americans, aviation (including information about the nearby B-52 crash site), and more in the region. The Mill Inn + Cafe in Dover-Foxcroft has live music and open mic nights at various times throughout the year–follow their Facebook or Instagram accounts for details. Bangor offers everything from professional theater performances to the Bangor Symphony Orchestra to a summer concert series on the waterfront. Throughout the year, catch live music or trivia nights at the downtown pub Paddy Murphy’s, or go to Sea Dog Brewing Company for Thursday karaoke nights. Explore the local brewery scene on the Growler Bus Tour in the Bangor area. Check out this link for more arts and entertainment in Bangor. If you’re heading north towards Moosehead Lake, stop into Indian Hill Trading Post* for…a very Maine shopping experience. Carrying everything from camping and hunting supplies to clothes and boots to souvenirs, along with a grocery store next door, Indian Hill Trading Post is your best introduction to the Moosehead Lake area. It’s definitely the place to go for those last-minute supplies you forgot, or just to get your fill of Maine accents. Greenville also has lots of local shops in town, such as Gallery on the Lake*. When I stopped in last summer, gallery owner Becky enthusiastically shared about various Maine artists that were featured in the store. —Explorer’s Guide Maine (18th Edition): As usual, the bulk of this Maine guide book covers coastal areas, but there are about 45 pages covering The Maine Highlands. —The Wildest Country: Exploring Thoreau’s Maine: Follow Thoreau’s famed excursions in the Maine’s wilderness, many of which were in The Maine Highlands, with modern commentary by J. Parker Huber. –Enjoy a compilation of essays about life in Maine from writer Sarah Smiley, who moved her family from Florida to Bangor, Maine, in Got Here As Soon As I Could: Discovering the Way Life Should Be. —Get a DeLorme Atlas, and don’t depend on your GPS—you probably won’t have a signal. The DeLorme Atlas is one that every Mainer who ventures north of Portland keeps in his car. We had several copies in our family growing up, and we never went on adventures without one. In addition to very detailed information about roads and their conditions, you’ll find trail head locations, campgrounds, and lots of other outdoor recreation labeled in the atlas. –If you’re traveling in Maine during the fall hunting seasons, stay safe and make sure you wear bright clothing—preferably hunter orange—for outdoor activities (and don’t forget a bright collar or vest for your pets!). –Don’t refer to what you know as a cabin on a lake as a cabin, summer home, or cottage—unless you want to be pegged as an “outta-statah.” It’s a camp. It may feel weird at first, but Mainers will know exactly what you’re talking about. –If someone says, “You can’t get there from here,” it may or may not be literal. It’s just a saying in Maine about how hard it can be to get from one place to another—the punchline to an old joke from Maine humorists Bert and I (Which Way to Millinocket?). Feel free to open up this Google My Map and make a copy into your own Google account. Access it on the web or via the My Maps app (Android app | iPhone app), and you can make your own notes and itinerary in your copy! Never used Google My Maps? Check out my guide to planning a trip with Google My Maps for more info! Each travel guide that I create is an in-depth resource that includes dining, lodging, and things to do in a particular city or region. All while embracing the philosophy of responsible travel–a mindset of traveling to connect, learn, and share experiences across cultures, and seeking to minimize our negative impact on the local culture, economy, and environment. As much as I would love to personally visit every one of these locations, time and resources don’t allow me to do so. This guide is a blend of personal recommendations and a curated list based on in-depth research and recommendations from locals. I want it to be clear which is which, as I would never want to recommend something I haven’t had personal experience with, so all of the items marked with an asterisk* are ones that I have visited. If it’s not marked with an asterisk, it’s something that I think is worth including but haven’t visited myself. The info provided here is a starting place for your planning and research—make sure to visit the website or call a location to find out about hours, fees, reservations, and other details. Also keep in mind that many restaurants and small shops close for the winter months. ***I received a media discount during my recent stay at The Mill Inn. I was not required to give a positive review, and all opinions expressed are my own.